Guest edited by Caitlin Gordon-Walker and Martha Black. 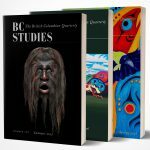 In this special issue of BC Studies we invite you into a conversation about museums in British Columbia and about the broader politics of colonialism and decolonization in which they are involved. Articles address both Indigenous and non-Indigenous institutions, focusing on topics of collections, archives, repatriation, collaboration, exhibitions, access, and engagement. Contributors, bringing together scholarship and museum practice, share their critical reflections and experiences within museums, illustrating some of the innovative ways in which museums in British Columbia are working to bring about and build new kinds of relationships between Indigenous and non-Indigenous people, as well as some of the persistent challenges they face. Many of the longer papers are coauthored or dialogical in form and are interspersed with shorter pieces to offer a wide range of perspectives and experiences. We hope these will provoke further discussions within, across, and beyond museum boundaries. “Shapeshifter/The Watcher” 36 x 48 inches, acrylic on canvas. Private collection. Martha Black has been curator of ethnology at the Royal BC Museum since 1997. Before coming to the RBCM she was curator and associate director of The Isaacs Gallery Ltd. in Toronto and then completed a PhD and taught at the University of Victoria, where she is an adjunct assistant professor in the Department of Art History and Visual Studies. Martha has worked on many collaborative exhibitions and projects with First Nations and on repatriation within and outside of the treaty negotiation process. Her publications include articles on museum collections and collectors, collaborations and repatriation, as well as Primeras Naciones de Canadá, cultural y artes vivas: Colecciones del Museo Real de Columbia Británica / First Nations of Canada, Living Cultures and Arts: Collections of the Royal British Columbia Museum (Bogotá: Museo del Oro, 2017), Out of the Mist: Treasures of the Nuu-chah-nulth Chiefs (Royal BC Museum, 1999) and Bella Bella: A Season of Heiltsuk Art (Royal Ontario Museum, Douglas & McIntyre, University of Washington Press, 1997). Martha has taught and lectured throughout Canada and abroad. Among her many RBCM projects is the on-going renewal of the museum’s First Peoples gallery. Jordan Coble, Westbank First Nation, is the Cultural and Operations Administrator of the Sncəwips Heritage Museum. He was born and raised in the heart of the Okanagan. He is dedicated to working for his community through the creation of awareness and appreciation through collaboration and authenticity. Jordan ensures the voice of the Okanagan/Syilx people is acknowledged and understood as valuable to all in relation to past, present and future generations. Jordan has lead the Sncəwips Heritage Museum to numerous awards and successful projects. Jordan takes pride in ensuring the Museum’s foundation is based on the best interests of the community and its members by providing a safe and comfortable space for positive experiences. Tracy Calogheros is the CEO for the Exploration Place, Museum + Science Centre in Prince George. Presently serving as the President of the Canadian Association of Science Centres and newly appointed to the Fraser Basin Council, her past roles have included work as the Vice Chair of the Emily Carr University of Art + Design’s Board of Governors, President for both the British Columbia Museums Association and Northern British Columbia Tourism Association. Ms. Calogheros was honoured in 2017 with the Governor General’s Award for History in Community Programs for her work with the Lheidli T’enneh Nation and, in 2006, received the Association of Science and Technology Centres’ award for Experienced Leadership in the Field. Married with three adult-ish children, she is passionate about her community and the role her facility plays in its richness of life. Jisgang Nika Collison belongs to the Kaay’ahl Laanas clan of the Haida Nation and is the executive director and curator of the Haida Gwaii Museum at Kay Llnagaay. Deeply committed to reconciliation, Collison is co-chair of the Haida Repatriation Committee and serves on the newly formed Canadian Museum Association’s Reconciliation Council. She is a recipient of the Michael M. Ames Award for Innovative Museum Anthropology from the Council for Museum Anthropology and was named one of the top 10 Cultural Professionals for 2017 by the BC Museums Association. Jisgang,Nika Collison belongs to the Kaay’ahl Laanas clan of the Haida Nation and is the executive director and curator of the Haida Gwaii Museum at Kay Llnagaay. Deeply committed to reconciliation, Collison is co-chair of the Haida Repatriation Committee and serves on the newly formed Canadian Museum Association’s Reconciliation Council. Karen Duffek is the Curator of Contemporary Visual Arts and Pacific Northwest at the Museum of Anthropology (MOA). Her research interests lie in the history of MOA’s Northwest Coast Indigenous collections, their connections to contemporary communities, and the relationships between contemporary art, museums, and cultural practice. Among her recent exhibitions are In a Different Light: Reflecting on Northwest Coast Art (co-curated with Bill McLennan and Jordan Wilson, 2017), Lawrence Paul Yuxweluptun: Unceded Territories (co-curated with Tania Willard, 2016), and Border Zones: New Art across Cultures (2010). Her publications include the books Lawrence Paul Yuxweluptun: Unceded Territories (co-edited with Tania Willard, 2016), Bill Reid and Beyond: Expanding on Modern Native Art (co-edited with Charlotte Townsend-Gault, 2004), and The Transforming Image: Painted Arts of Northwest Coast First Nations (co-authored with Bill McLennan, 2000). Caitlin Gordon-Walker is an interdisciplinary scholar whose research explores the contradictory character of museums and other sites of public heritage production, which act simultaneously as authoritative forms of representation and sites of dialogue and interaction, focusing on conversations around colonialism, nationalism, cultural difference, and migration. Recent publications include Exhibiting Nation: Multicultural Nationalism (and Its Limits) in Canada’s Museums (UBC Press, 2016) and “Recognition and Repentance in Canadian Multicultural Heritage: The Community Historical Recognition Program and Italian Canadian Memorializing” (Journal of Canadian Studies, with Analays Alvarez and Susan Ashley). Shawn Hunt was born in Vancouver Canada in 1975. He is an artist of Heiltsuk, French and Scottish ancestry. He has a diploma in studio art from Capilano college as well as a BFA from the University of British Columbia where he majored in sculpture and drawing. Shawn comes from a family of artists. His father is Bradley Hunt, a prominent Heiltsuk artist with whom he apprenticed for 5 years. Shawn also did an apprenticeship with Coast Salish painter Lawrence Paul Yuxweluptun from 2012 – 2015. Shawn’s work takes on a complexity of influence from both his training in traditional Heiltsuk design, wood carving, jewelry carving and painting and his engagement with contemporary questions of subversion, preconception and fluid meanings. Jennifer Kramer holds a joint position at the University of British Columbia as an Associate Professor in the Department of Anthropology and as Curator of the Pacific Northwest at the Museum of Anthropology (MOA). As a critical and collaborative museologist, Dr. Kramer works with First Nations from the central Northwest Coast of British Columbia. Her exhibitions at MOA include Kesu’: The Art and Life of Doug Cranmer (2012-2013) and Layers of Influencing: Unfolding Cloth across Cultures (2016-2017). Recent publications on representation, museums and cultural property include: “Betting on the Raven: Ethical Relationality and Nuxalk Cultural Property” in The Routledge Companion to Cultural Property (eds. Jane Anderson and Haidy Geismar) 2017:152-167 and “Mobius Museology: Curating and Critiquing the Multiversity Galleries at the UBC Museum of Anthropology” in Museum Transformations: Art, Culture, History. Volume 4: The Handbook of Museum Studies (eds. Annie E. Coombes and Ruth B. Phillips) 2015:489-510. Nicola Levell is an associate professor of museum and visual anthropology at the University of British Columbia, Vancouver, and an independent curator. She has curated art installations in the UK, Portugal, the USA and Canada. Her recent publications include The Marvellous Real: Art from Mexico, 1926-2011 (2013), The Seriousness of Play: Michael Nicoll Yahgulanaas (2016) and From Carnival to Lucha Libre: Mexican Masks and Devotions (2018, edited with Anthony Shelton). Bruce Granville Miller is a professor of anthropology at UBC. His work centers on Indigenous-state relations and Coast Salish ethnography. He has recently edited theUpper Skagit Indian Tribe Historical Atlas. Susan Rowley is an associate professor in the Department of Anthropology and a curator at the Museum of Anthropology at the University of British Columbia. Since 2005 she has been the Museum of Anthropology’s member on the Steering Group of the Reciprocal Research Network (www. rrncommunity.org). She was a member of the curatorial team for cə̓ snaʔəm, the city before the city and co-curated the exhibition at MOA. Her most recent exhibition was The Fabric of Our Land: Salish Weaving. Her research focuses on material culture studies, representation, intellectual property rights, repatriation, access to cultural heritage and museums. David Schaepe is the Director and Senior Archaeologist at the Stó:lō Research and Resource Management Centre at Stó:lō Nation, in Chilliwack, B.C. He began working for the Stó:lō in 1997. He is active in community-based archaeology, heritage landscape management, repatriation, cultural tourism and curriculum development, and is involved in a number of collaborations including the Reciprocal Research Network (RRN) and Digital Sq’éwlets on-line projects, and he recently edited Being Ts’elxwéyeqw. Dave is an Adjunct Professor in Simon Fraser University’s Department of Resource and Environmental Management, and also in the Department of Social, Cultural and Media Studies at the University of the Fraser Valley. Alyssa Tobin, a professional archaeologist, is the Curator at The Exploration Place in Prince George, British Columbia. Currently her work focuses on researching and curating exhibits on the history of the Northern Interior of British Columbia. She is passionate about building meaningful relationships with local Indigenous communities and making sure Indigenous perspectives are represented throughout The Exploration Place. Genevieve Weber is an archivist with the Royal BC Museum and Archives. As the Indigenous liaison for the BC Archives she enjoys working with Nations from all over BC. Her research interests include ownership and intellectual rights in Indigenous record keeping, and decolonizing archival practice in Canada. William White was born into the Gitwilgyoots tribe of the Tsimshian nation in 1960, he was born into the Raven clan of that tribe. Willy was raised to be proud of who he is and where he comes from, his elders instilled in him the proud cultural beliefs that he still holds close to his heart. At the age of 22 William started to learn basket weaving from his aunt, Betty Sampson. He soon realized she was the last basket weaver from the Tsimshian nation, so he started to weave with a passion to learn everything he could from his aunt. Willy went outside of his village seeking traditional knowledge from other relatives and from other weavers in Alaska and Haida Hawaii. William went on to teach his people the traditional ways to produce cedar bark baskets. He taught in 4 villages to ensure the Tsimshian weaving techniques would survive and flourish. He is proud to say he succeeded in this effort. In 1994 William learned to weave Raven”stail ( northern geometric) then in 1995 he would learn to weave chilkat from an alaskan Tlingit, Anna Ehlers , he has had a total of 30 training from his teacher. Willy went on to explore museums and personal collections to further his desire to improve his abilities in this style of wool weaving. He has continued to expand his Traditional knowledge by weaving and teaching his people . William has taught wool weaving to many women in several villages along the bc coast. He has completed 4 robes and is currently working on his 41st apron. Teaching his students to weave and research in museums is his passion. Tania Willard, Secwepemc Nation, works within the shifting ideas of contemporary and traditional as it relates to cultural arts and production. Often working with bodies of knowledge and skills that are conceptually linked to her interest in intersections between Aboriginal and other cultures. Willard’ curatorial work includes co-curating Beat Nation: Art Hip Hop and Aboriginal Culture, a national touring exhibition first presented at Vancouver Art Gallery in 2011 and Unceded Territories: Lawrence Paul Yuxweluptun at the Museum of Anthropology with Karen Duffek. Recent curated exhibitions include selection as one of a team of National curators for LandMarks2017/Repéres2017 commissioning artists in National Parks and Historic sites in 2017. Het recent body of work as a Masters student explores Secwepemc anthropology collections in museums querying intuition, creative and Indigenous ways of knowing within the archive. Willard’s collaborative art projects include BUSH gallery, a conceptual space for land based art and action led by Indigenous artists. Jordan Wilson is an emerging curator and writer, and is currently a PhD student in Sociocultural Anthropology at New York University. He is a member of the Musqueam First Nation. Wilson holds an MA in Anthropology and a BA in First Nations Studies, both obtained at the University of British Columbia. Wilson was a co-curator of the exhibits c ̓əsnaʔəm, the city before the city (2015) and In a Different Light: Reflecting on Northwest Coast Art (2017) at the UBC Museum of Anthropology.